Off-Grid Solar refers to systems, applications as well as projects and policies addressing the independent generation and usage of solar energy without connection to a power grid. Living off-the-grid (or shortly: off-grid) refers to self-sufficient living conditions and lifestyle without reliance on one or more public utilities. In the solar industry, off-the-grid solar-powered facilities operate independent from public supply of electricity and – as the “solar” attribute indicates – use solar photovoltaic technology to generate the necessary amount of electricity required to power all the electric appliances of that facility. Such appliances may include household devices such as bulbs, fans, TVs, computers and fridges, air conditioners – termed as residential off-grid solar – and even industrial equipment in a factory including production machinery – which is termed as industrial off-grid solar. While there are various combination possibilities with other renewable energy sources, such as off-grid solar-wind hybrid systems, as per definition, 100% off-grid solar systems operate these these electrical appliances fully without any supplementary sources or other (renewable) energy systems such as diesel generators or wind turbines. 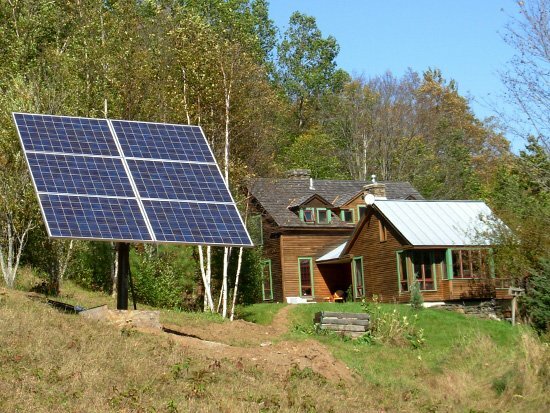 Off-grid solar systems work completely independent from the national electicity grid, while on-grid systems are power-grid connected energy-producing units. Yet, off-grid energy systems – regardless of the technology applied – may also be a combined set of (different) power-generating units, such as a diesel generator or a wind power systems, termed as semi off-grid solar system. 1) affordability: there is still a large gap between system prices – even though having enormously declined – and the financial capacities of the clientele that actually would and can most benefit from off-grid solar – rural poors in many countries of the southern hemisphere. 2) technological limitations of off-grid solar batteries. For a fully efficient day and night solar off-grid living, for standard households in Western Europe for example, large capacity batteries are needed as they are particularly used during the nighttime when also average household power consumption is highest and there is no more sunshine. However, such batteries are still an expensive component of off-grid solar systems with only limited lifecycles of on average 3.5 years and most then be replaced, making off-grid solar prohibitively expensive for such standard households in the west. 3) anti-off-grid solar lobby: even though a world where all households, workshops and public institutions generate, store and use their own electricity is a prospect still very distant for decades, if not centuries, a major obstacle to the promotion of off-grid solar are traditional power production and utility companies that would in such a scenario only be useful as power supply backups and as such greatly loose their current, economically powerful status. More than 1.8 billion people in this world lack general access to stable electricity supply. Cut off from the electrical grids in their countries, these are forced to resort to fuel-based power solutions for lighting, heating or cooling. Fuel-based technologies are not only subject to volatile fuel prices, imposing high costs on their users, but are also responsible for substantial emissions of poisonous greenhouse gases that with accumulated high polution not only impact the health of individuals but also of whole societies and countries. In the long term, fuel-based technologies are neither economically nor ecologically sustainable. Green off-grid technologies are in this regard an attractive alternative that are independent from infrastructural conditions and provide lasting economic advantages and savings. The access to independent, durable and lasting to electricity sources is the ultimate basic pillar of economic growth and individual success, allowing for longer times of working and studying and facilitating communications and access to information. In this regard, in may countries and even on the international level there are off-grid solar programs and policies to promote the greater use of off-grid renewable energy technologies, most imp0rtantly solar, even to financially weak households applying schemes such off-grid solar micro credit schemes, a concept conceived and most prominently being implemented by the Bangladeshi organization Grameen Shakti.